Teacher: Hello class, this lesson will cover more on Essential Guitar Techniques. This lesson will cover using the Tremolo Bar, or otherwise known as the Vibrato Bar or Whammy Bar. Of course you will need a tremolo bar system on your guitar for this lesson, however if you don't many of the licks you can get by without using one. This lesson will be good for all of you wanting to understand how various sounds are created using this system. Teacher: Can any of you think of any guitarists who use the tremolo guitar system? Teacher: Very good! In fact the vibrato system was used by the Rockabilly and blues players, and even country. Most used a "Bigsby" system and Fender later introduced their patented system. 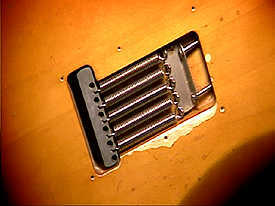 Here is a basic Fender Strat system. Teacher: The Fender system is very effective for using vibrato, however it needs to be set correctly so the instrument doesn't go out of tune. 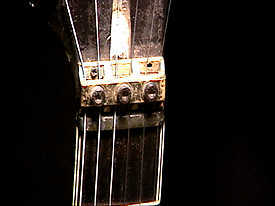 I use 5 springs on my guitar to help the system to work better. Teacher: I also use a graphic nut to help the string slide better through the nut. Teacher: During the late 70s and 80s guitarists would need a better trem system because of the heavy use of the bar. dh: Do the springs come in different tensions? Teacher: DH, the Fenders come stock, however I'm sure there are companies who sell different tensions. Here's my locking system. Teacher: In this picture I have an older Kahler system, Floyd Rose systems are very common as well. Here's the locking nut. Teacher: The locking nut helps to keep the strings in tune, avoiding sliding and getting caught in the nut as they change tension. Let's get into the technique. Teacher: In this example I first pick the 3rd string (G), and then grab the bar and lower the pitch. Here's the next basic example. Teacher: This example picks the note and raises the pitch, I raise and lower the pitch one octave in both examples. In this example I play a harmonic note and use the trem bar. Teacher: Playing the harmonic, and then using the bar creates a screaming type sound common to Hendrix, Van Halen, Vai,... Here's the same technique raising the note. Teacher: Here's the same technique raising and lowering the pitch using a regular note and harmonic. Teacher: Let's try some licks now. In these examples I play the tab slow and the video at regular speed. 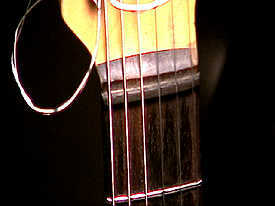 Teacher: In this example you hammer/pull-off on the open to 2nd fret/3rd string. wing5wong: how far is it possible to raise or lower the pitch of a note? Teacher: Wing5wong, that depends on how good of a locking system you have and how it is setup. A great guitarist to listen too is Steve Vai, he is a master at using the Whammy Bar. Teacher: Hendrix introduced playing hammer-ons and using the trem bar. Here's another lick example. Teacher: In this example you play a series of pull-offs lowing and raising the trem bar. Here's the next example. Teacher: This lick uses a series of hammer/pull-off notes while you lower and raise the trem bar. Here are some licks you might recognize. Teacher: In this version of Star Spangle banner, you start with the melody and then lower the bar when playing the 5th fret notes on the 1st and second strings. Notice how you hit the 7th fret to get the sound of the 6th string started and drop the bar and slowly raise the note as you play the open 6th string. Here's the next section. Teacher: This continues the melody, then using the trem bar to lower the pitch on the 5th fret/3rd string, and then playing a flat 5 interval as you are lowering the notes. This creates a sound reminiscent of a British Ambulance siren. Hendrix used the trem bar to create sounds like bombs, airplanes,... Here's the next riff. Teacher: In this Van Halen example you play a hammer/pull-off combination in the A Minor blues, and then play a descending run in the scale that shifts into a chromatic run and then a trem bar dive on the open A string. You hit the 6th string and then raise the pitch. 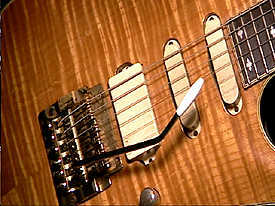 Make sure the trem bar is depressed on the 6th string, and then slowly raise the note. Here's the next riff. Teacher: This riff uses all harmonics, and then lowers the trem bar on the last few notes. Here's another effect you can try. Teacher: You depress the trem bar before each double-stop note and then slowly raise the bar to create the sound of a motorcycle. Early rockabilly, country and blues players actually used the tremolo bar to play vibrato, instead of using the fret hand, thus the name "vibrato bar" or "tremolo bar. Here's the basic technique. Teacher: This basic technique plays a slow vibrato using the trem bar for each note, while descending the A Dorian mode. You can alter the vibrato speed as well. Teacher: Practice using the various speeds using the trem bar. 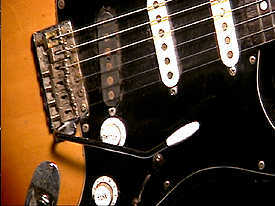 Many country and rockabilly players would also use the trem bar to vibrato chords. Teacher: There are players like Steve Vai, Satriani, Alan Holdsworth, that will use the trem bar to accent melodies. Here's a few examples you can try. Teacher: In this simple melody you start by depressing the vibrato bar and then raising it to regular pitch. Notice the trem bar vibrato on the last note. Here's another example. Teacher: This example uses the basic technique in the last lick, but this time you use harmonic double-stop notes. Teacher: Well time to go, I hope this gives you more ideas on using your trem bar! Bye!